In a bid to decongest Rohtang Jot and ensure smooth flow of traffic and keep up with the repair work, BRO along with Himachal Government has come out with the following rules for traffic heading to Rohtang Jot. 1. Vehicles from outside Himachal aren’t allowed to go to Rohtang Jot from Manali side, unless they are heading to Ladakh, Lahaul, Spiti or Pangi Valley i.e. those going to Rohtang Jot for sightseeing, have to hire local taxi or bus for the purpose. Those who are planning to go to Ladakh, Lahaul, Spiti or Pangi Valley, have to get permit made from the SDM Office in Manali (free of cost), contact numbers for Manali SDM Office are, 09418460974, 01902254100 and 01902254200. 2. Rohtang Jot is closed for repair work on Tuesdays, so apart from traffic heading to Ladakh in the wee hours of the morning or late in the evening, traffic to Rohtang Jot isn’t permitted. 3. 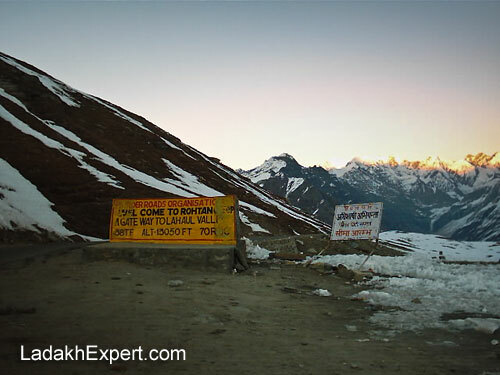 Only vehicles going to Ladakh, Lahaul, Spiti or Pangi Valley can go towards Rohtang Jot before 6AM. 4. From 6AM to 11AM traffic would be permitted to go to Rohtang Pass from Manali side, however they will not be allowed to return before 1PM. Only traffic which is coming from Ladakh, Lahaul, Spiti or Pangi Valley and certified by the Kokhsar Check Post will be allowed to go towards Manali. 5. From 1PM to 5PM, traffic will be allowed to return to Manali. However no traffic will be allowed towards Rohtang Jot. 6. After 5PM heavy vehicles will be allowed to ply on the Rohtang Jot route from both sides. While these rules are certainly going to cause annoyance to tourists visiting Rohtang Pass, they might just help authorities deal with the long jams which plague the road to Rohtang during tourist season each year and results in rising level of pollution and wastage of fuel and time.